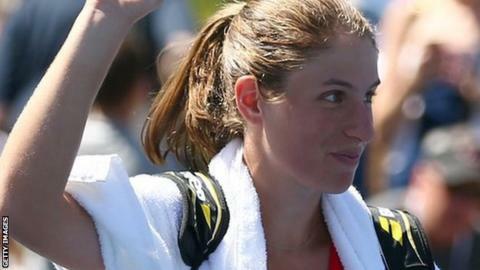 Johanna Konta is to become the new British number one following Heather Watson's defeat in the first round of the Wuhan Open in China. Current British number one Watson, 23, saved four match points but was unable to avoid a 6-3 2-6 6-3 loss to former world number one Jelena Jankovic. Konta's win over German Andrea Petkovic in her first-round match means the 24-year-old will go above Watson when the new rankings are announced next week. Konta next plays Victoria Azarenka. Born in Sydney but based in Eastbourne since becoming a British citizen in 2012, Konta has won 19 of her last 20 matches since losing to Russian Maria Sharapova at Wimbledon. That spectacular run of form saw her reach the fourth round of the US Open as a qualifier earlier in September. Watson, who like Konta came through two rounds of qualifying in Wuhan, has now suffered successive first-round exits following a similar defeat in the Korea Open. Jankovic won a match of shifting momentum over two hours and 14 minutes, just two days after winning her first WTA title for two years in Guangzhou. "I am really disappointed with today," said Watson. "I thought my form had been good coming in. "I knew she would be coming in with a lot of confidence but also a bit tired from her title in Guangzhou, so I saw this a big opportunity. "I feel like I really missed out but that's my fault and I will have to look back and work on the things I need to work on."